Learn more about the course and experience the teacher during this webinar. For 40 years Ananda has trained teachers in meditation techniques grounded in the highest traditions of India, taught by Paramhansa Yogananda. With that experience, we have created an online meditation teacher training that has everything our in-person teacher training offers — except, of course, the powerful spiritual boost you receive from meditating at Ananda Village, home of dedicated meditators for nearly 50 years. With extensive personal guidance from our faculty, plus regular post-training support, you’ll have all you need to become the best teacher you can be. 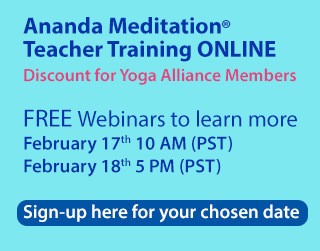 JOIN Online training leaders Diksha and Gyandev, the Directors of Ananda Meditation® Teacher Training. This live webinar will provide a complete overview to the core concepts shared in the Online Meditation Teacher Training, offered February 27 through May 8, 2019. Gyandev & Diksha will share with you about the method of the online training, special components, student responsibilities, and the many ways they will support you and build the online class. Sign-up here for your chosen date. We train you to teach any student, whether s/he is looking for stress reduction, or spiritual growth, or anything in-between: sharper concentration, calmer emotions, better health, more effectiveness, or greater happiness. You’ll be ready to share the benefits of meditation with the growing numbers of people who are hungry for them. No dates scheduled for Online Meditation Teacher Training Live Webinar at this time. Yoga Alliance RYTs and E-RYTs receive a 10% discount on the total cost for Online Meditation Teacher Training Live Webinar. To receive the discount, please tell us when you register: your name as it appears in the Yoga Alliance registry, and your city/state/country.